As parents, we always want to keep our children safe no matter where they are, who they’re with, or what they’re doing. But when it comes to riding safely in the car, a lot of parents are unsure and wondering about the do’s and don’ts of car seat safety. A common question that parents ask is “When should my child turn forward-facing in their car seat?” With it being summertime and everyone traveling on the road, we thought this is the perfect time to explain why car seats should be rear-facing until age 2 and talk about the TurnAfter2 campaign! Why should my child’s car seat be rear-facing until age 2? In 2011, the American Academy of Pediatrics (AAP) said children should remain in a rear-facing seat until they are at least two years of age. Or until they reach the highest weight or height allowed by their car safety seat manufacturer. Why is that? When rear-facing, a child’s head, neck and spine are all supported by the car seat during an accident. Instead of having their head thrown violently away from their body from a frontal car crash, their head is cradled in their car seat. Which is the best way to avoid major brain and spinal cord injuries. What about their legs? They looked crammed. I get that you might be thinking, “how does a 2-year-old fit comfortably rear-facing?” Your toddler’s legs will probably be touching the back of the seat and have their knees bent while rear-facing in their car seat. While you may be thinking that this can’t be comfortable for your child, parents of toddlers that are forward-facing can also probably tell you that their children try to prop up their feet on the back of the front seat whenever they can! So having their feet touching the seat is not uncomfortable or a problem. Also, toddlers have much more flexibility and range of motion in their hips, knees and ankles than we do. This helps them remain comfortable in almost any position. As you may know, I am a mother to a 9-month-old son. Lately, I have found him in many different weird-looking positions that I think look uncomfortable. However, he seems as happy as a clam. In my opinion these positions can look silly and uncomfortable. But to him he’s fine, just like his car seat. He is okay! And, most importantly, he is safe. If your main concern is safety–which I would think it is–something that’s good to know is that no matter how scrunched up the rear-facing child’s legs look, it does not cause injury to their legs in a crash. There haven’t been any documented cases of rear-facing children breaking their legs, hips, feet, etc., due to their knees being bent and their feet touching the back of the seat. However, studies do show that forward-facing kids suffer many more leg injuries than rear-facing kids. The leg injuries to forward-facing children happen when the child’s legs fly up and hit the back of the front seat. The main things we should be concerned about are their head and their neck. I’ve already turned my child forward-facing. Should I turn her back rear-facing? What car seats should I be looking at to keep my child safely rear-facing? A car seat brand that I have gotten to know and trust is Chicco. They are a leader in car seat safety and manufacturing. Also, they have an award-winning car seat portfolio that includes their top-rated KeyFit 30 car seat, their NextFit Convertible Car Seats, the first-of-its-kind Fit2 Infant & Toddler Car Seat, as well as harness, backless and belt-positioning booster seats. If you’re trying to choose a good quality and safe car seat for your baby, Chicco is an amazing option! 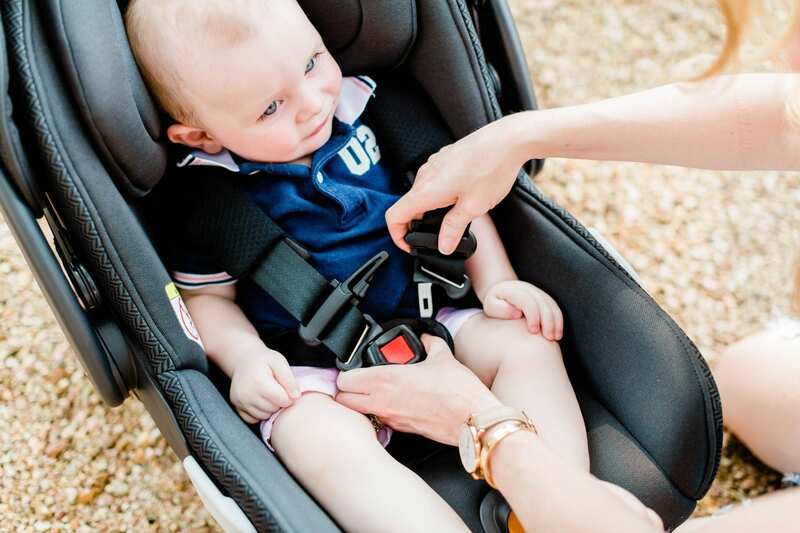 Other cool features include the unique one-hand carry handle, 7-position headrest, the removable canopy, innovative chest clip designed for infants and toddlers, and an ultra-padded, no-rethread harness with one-pull tightener. What’s really cool is that since TurnAfter2™ launched one year ago, the number of parents who are aware of the AAP’s 2-year rear-facing recommendation has dramatically increased to 73%, up 26% since 2017. Yaayyy! That’s huge! Chicco explored where parents were getting their information and what would prompt parents to put children in the forward-facing position prematurely. The good news is that, rather than going to a search engine, it’s pediatricians who are the go-to source for information on a child’s health and well-being, particularly car seat safety advice. More than seven-in-10 (71%) parents of kids under two say they talk to their pediatrician about when it’s right to turn their child around. However, when it comes to turning children to forward-facing before the age of two, parents are projecting their child’s perceived level of comfort, thinking a child’s legs looked cramped (40%) or a child simply looks uncomfortable rear-facing (32%). Now that we know kids are actually fine and indeed much safer in the rear-facing position, we’re hoping that more parents will share how they’re keeping their children riding rear-facing for two years or longer. So I’m asking you a favor. Please spread the word by using the #TurnAfter2 hashtag on social media to share photos of your rear-facing-riding kids, in an effort to inspire other parents to keep their kids rear-facing for as long as possible. Whether you’re telling them about the ease, convenience and safety of the Fit2 (I highly recommend adding it to your wish list), or pictures of your child in their infant and convertible car seat combination, let’s spread the word about keeping our children rear-facing until at least two and keep all of our babies safe.